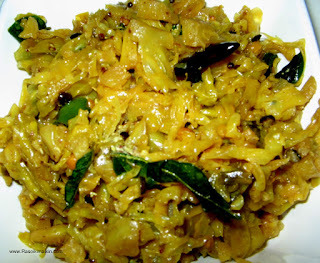 Cabbage Ava pettina curry is famous in andhra side ,and even in traditional functions, because it doesnt have onion or garlic..There are many varieties of curries we do with cabbage,but this one is prepared in coastal andhra homes,and andhra is famous for ava pettina kuralu.. Boil and cook the chopped cabbage pieces by adding water,in a prestige cooker for 2 whisles..switch off and let it cool. After it is cooled open the cooker and strain the water from the cabbagepieces. Now add tamarind pulp and salt and again cook for 5 more mins,after it is cooked switch off and let it cool. In the meanwhile prepare ava mixture ,it will be just 1 tbsp full and keep it aside. After the cabbage pieces are cooled , strain away fully the tamarind pulp,water from the cooked cabbage pieces and keep it aside. Now place a pan and add 2 to 3 tbsp of oil, next add urad daal,redchilli slits,and saute well. Next add green chilli slits,hing,haldhi and curry leaves and mix well. Now add the cooked and strained cabbage pieces,and mix well. Cook in low flame for 3 minutes and switch off. Now add the ava paste in the cabbage curry and mix well. Let it settle for more than half an hour to get the yummy taste. Nice post...loved your presentation dear. Even I prepared cabbage curry but a different version,would post some other time. Ur version is interesting too. yummy and tempting cabbage curry.